When something is described as ergonomic, it doesn’t just mean it is fit for human use. ‘Ergonomic’ means that special attention has been given in the design process to make sure it is the best possible fit for the environment, the task and most importantly the user. Poor ergonomics describes a lack of unity between environment, task and equipment. A bar stool, for example, may not be considered ergonomic due to its rigidness, lack of lumbar support and static position. However, in the right environment (a bar), it fulfils the role perfectly. 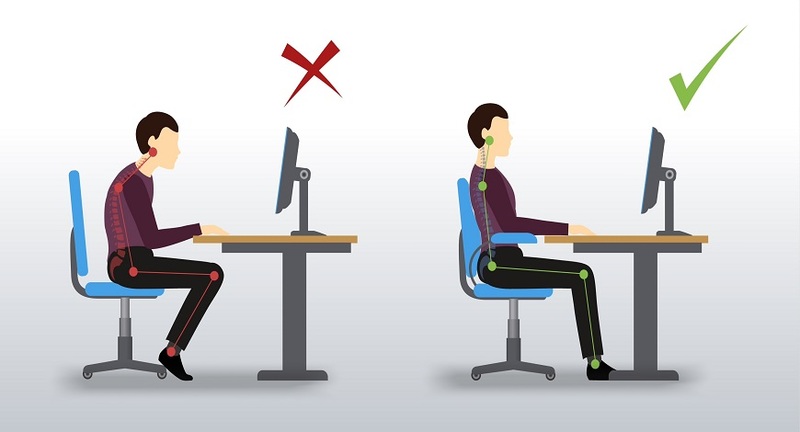 Whereas in an office environment, the user needs a chair with adjustments, lumbar support, armrests and much more to make it ergonomically suitable for the task and the user. People often underestimate the importance of good posture. We all know that poor posture – such as slumping and slouching, can cause aches, pains and injuries, but research shows that posture can also affect how we feel, think and behave. One study found that good posture can help us feel more positive and recall positive memories more easily. Body language is important: when we stand or sit tall, we feel more confident, powerful and alert. Spending too long doing anything is bad for you. If you work at a screen all day, you are at greater risk of eye strain, headaches, blurred vision and general discomfort. You are also more likely to develop musculoskeletal issues. Managers should encourage regular breaks. For those who stand up and move around for their jobs, adequate seating should be provided and used at regular intervals. We all use technology every day. Slow or unusable software causes frustrated workers and decreased productivity. Usability is what ergonomics is all about. The temperature can affect people more than you think. No one likes being too hot or too cold. Either way, we cannot concentrate correctly or function correctly when the temperature is not right. We all have different preferences but it is important the employer has the temperature in mind. High humidity will increase sweating which no one likes and low humidity will dry your throat and eyes out. Quality of air and level of humidity is important too. Lighting can put a strain on your eyes and especially when you are sat looking at a screen all day. Lights shouldn’t shine directly downwards and there should be as much natural light as possible. Screen glare can also cause eye strain. Filters on your screens can help solve reflection or glare issues. Noise can be disruptive. Depending on the job, having quiet places or noise cancelling headsets would be useful. Space is hugely important for productivity. Be it office space, desk space or amenities. With little desk space, bad keyboard and mouse habits could increase and cause wrist issues. Bad office space could mean little room between yourself and your colleagues making it an awkward and annoying place to work. At Atlantic Office Ergonomics we can help with all of this. So just contact us and we can advise on all your ergonomic needs!